Miah Ke-leigh: Q&A #1: Prom, University Plans & Moving Countries?! 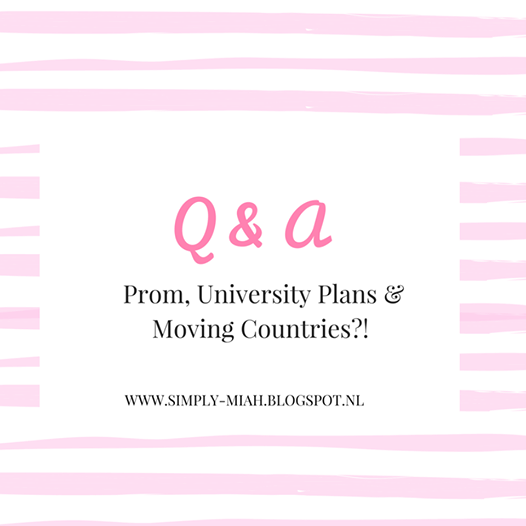 Q&A #1: Prom, University Plans & Moving Countries?! A few days ago, I asked you all to send in any questions you might have. The platform I use is Ask.fm, so if you have any questions that didn't get answered in this blog post, send them in to www.ask.fm/miahkeleigh and I'll be sure to include them in my next post! I don't really have favorite bloggers. If I had to choose it would be Freddy Cousin Brown and Aurora Mohn. For Youtubers it'd have to be Nazanin Kavari, Nathalie Paris and Eva Marisol! In my free time I usually hang out with my friends, watch series, go shopping. I also like exploring and writing. For high-end makeup brands I will always go with Urban Decay and MAC. Drugstore makeup brands include Maybelline, Makeup Revolution and Essence. I love traveling so much and each of the countries that I have visited all had something different to offer! I really liked visiting Croatia because it is so beautiful. I went 6 years ago in the summer of 2010 and it is still one of my most memorable holidays The beaches were amazing! Another country I really liked was Switzerland. I definitely think you need to like the cold/wintery atmosphere if you move to Holland, or at least you need to be willing to adapt to it because it's constantly cold and rainy. I love staying here though, despite not initially wanting to move. There are so many wonderful people, it is safe and it's super easy to visit other cities or countries via trains. I attend a private international school. I like it but my school is incredibly small which means that you know everyone and everyone knows you. I only have 10 people in my grade/year! For sure Tumblr, WeHeartIt, Pinterest, Kayla Itsine's SWEAT app, SnapChat, MakeupSocial and the NikiAndGabi App. Not at all! I get this question so often because my hair is always straight. I prefer having my hair straightened/blow-dried because it is a lot easier to manage and style. I usually straighten my hair on a Sunday and it will last me about a Wednesday, maybe even Thursday, because my hair doesn't get greasy quickly so it works for me. Aside from that, I've been wearing my hair in its natural curly state a lot recently because I know how important it is to take breaks from heat/styling tools! I have been planning a lot of collabs this past month. I have other beauty and lifestyle bloggers as well as a makeup artist who I will be working with! There's Francoise who I already did a collab with last december. Rebecca who participated in my Beauty Blogger Tag, Lily who tagged me in her Christmas Tag last year, Isabel who I just recently met and will be doing a collab with soon and last but definitely not least, Kerrie who I am also planning a beauty and lifestyle post with! I have visited Hong Kong, Singapore, Dubai, The Netherlands (before I moved), Namibia, Thailand, Croatia, France, Italy, Germany, Austria, Switzerland and Costa Rica. Probably how people always assume stuff without knowing the full story - but that is every high school so I guess you can't do much about it. It depends where I get accepted for University! I'm hoping to stay in Holland though, if not I will (hopefully) be studying abroad. I have a collab planned for Valentine's Day! That's all I can say now, as I can't give too much away! I want to study Journalism and Communication/Mass Media! My dream is to be a Magazine Editor and continue with writing, whether that is print or digital. Another option is to go into marketing/advertising. I haven't decided yet! The thing is, my school is incredibly small as I mentioned earlier so our school has prom for grades 9 - 12 every single year. By the time you get to grade 12, it isn't as special anymore. Sure it's your last one, but at an International School every year could consist of lasts because people are always moving. If I do decide to go, I'll post a GRWM (Get Ready With Me video) and footage of the prom!